Clinic with Nicolas Warembourg F-531! World class Windsurf Spot in the Desert! Book your surfing holiday now! If you are looking for a windy place to surf, you have hit the jackpot. 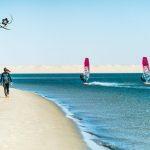 The Dakhla lagoon is a world class windsurf spot for all levels from beginner to professional. Close to the beach there are perfect flat water conditions while further out the water is choppy. It is the best playground to learn your first chop hop or even the latest freestyle moves. NE is the main wind direction – the average wind speed is 15-25 knots in winter, in the summer month you can even expect more then 30 knots. He is a passionate Windsurfer for more then 25 years . With his family he lives between Dakhla, Palekastro and London. 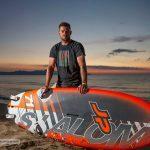 He will professionally run and manage the Freak Windsurf Dakhla Attitude center. Dakhla is an incredible windsurfing spot with an average of 330 windy days per year! The main wind direction is northeast. Thanks to the flat water lagoon wind speeds are varying between 15 – 25 knots. In July and August speeds above 30 knots are common. Air temperatures are topping at 25°C in August and range from 20-24 °C for the rest of the year.